Examples, solutions, videos, and worksheets to help Grade 8 students learn how to draw a Perpendicular Line from a Point that is on a Line. 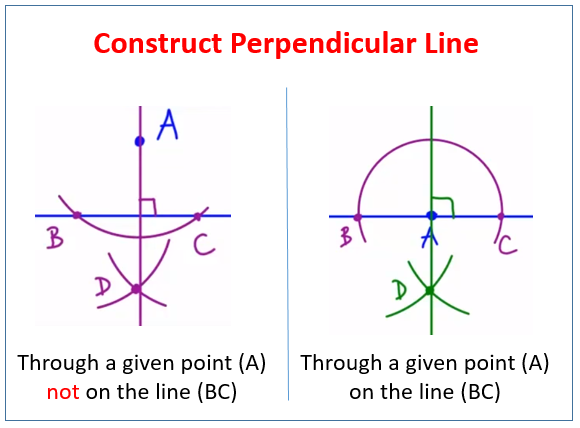 The following diagrams show how to construct perpendicular lines through a point not on the line and through a point on the line. Scroll down the page for more examples and solutions. Constructing perpendicular lines, looking at the two cases where the point is on the line, and the point is off the line. How to Construct a Perpendicular Line through a Point on the Given Line? 1. Open the compass to a radius less than half the segment. 2. Draw two arcs intersecting the line on both sides of the point. 3. Draw two arcs using the intersection points as the centers. Mark the point of intersection of the two arcs. 4. Construct a line between this point and the original point. How To Draw A Line Perpendicular to a Straight Line Through a Given Point on the line? How To Draw a Perpendicular to a Straight line from a Given Point? How to draw a perpendicular line from a point that is on a line?